All the questions asked using the Pubble widgets on your website are pushed into your Pubble dashboard, this is where the main action takes place. Here you will see all questions and activity relating to your team. 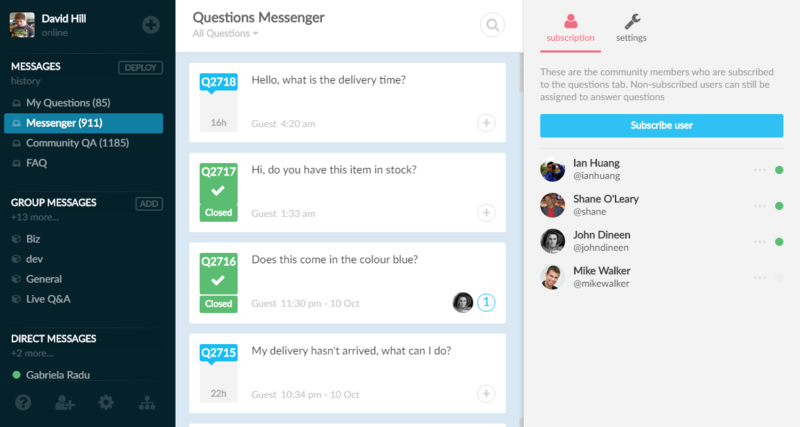 From here you can manage questions, groups and FAQs, assign questions to teammates and chat privately with them. 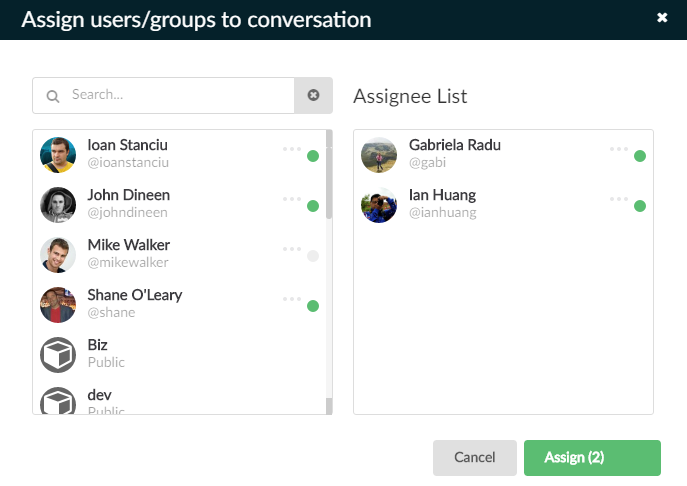 The left column is where you access your questions, view groups and team members. The middle column is the main display area where you will see conversations. The right column displays data about conversations, groups and so on. Question number - each question has a unique number, so you can easily reference a question to another member of your community, or just type it in a group chat whenever you need help. To reference a question just type 'Q' followed by the question number, for example "Q42", this question will then be embedded into the chat. Unread - If you haven't read the question you will see an orange tag on the question card. Someone might have read it but not you. Resolved - When the tags on a question card are green, then the status of that Question is "resolved". This means that either one of your colleagues or Pubblebot has provided an answer and the question was manually closed. So your customer is happy! Manual Assign: to manually assign someone to a question click the "Assign" option on the question. You will see the dialog which displays teammates and groups on the left side, clicking them will move them to the right side. Once you have selected those you want to assign finish by clicking the Assign button. In the Assignee input type the name of the teammate or group you want to assign to and they will by prompted below, clicking them will select them for auto assign. 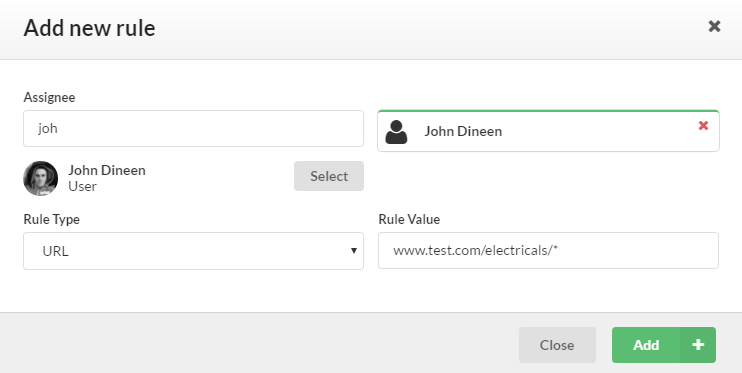 Select a Rule Type of either URL, Keyword or App and in the Rule Value input either a URL, keyword or select the app, depending on the rule type you selected. 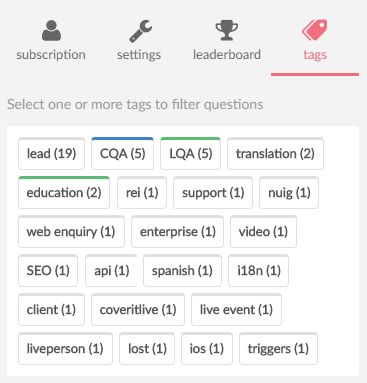 If you select the App rule type you can auto-assign when a question is asked on that app. However this is only recommended for assigning to groups. For individual users we recommend you add that user as a subscriber or moderator of the app. Conversations can be conveniently searched by tag from the right-hand side. You can also search by multiple tags by clicking them. The number next to the tag indicates how many conversations are attached to that tag. Sometimes you may need to delete questions, if there is offending content for example. 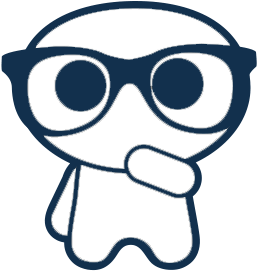 App subscribers and moderators are able to delete a conversation. There are two types of internal question. Sometimes you might need to ask your own team a question, especially if your team is distributed or you may just have an urgent question which you do not want to get lost the hubbub of a chat channel. 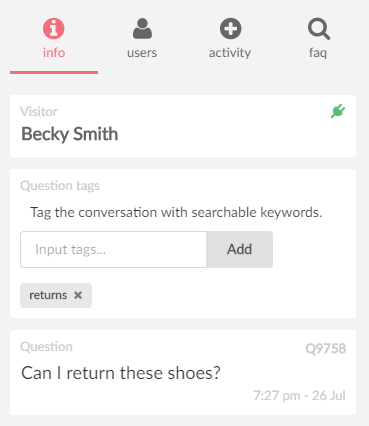 From the dashboard you can ask your team a question, just select "Ask internal question" from the menu, it works just the same way as visitor using the widget, except the question is internal - only your team can see it. Other times you might need to ask a question on behalf of somebody else (If you are handling in-store retail inquiries for example). In this case select "Ask as visitor" from the menu. The form here is similar but with a few extra options to capture the contact details of the person with the initial question. When the question is answered they will be notified via email or SMS with a link to view the response. Canned messages are short pieces of pre-entered text which can be used to quickly reply to a conversation, making typing common responses more efficient. 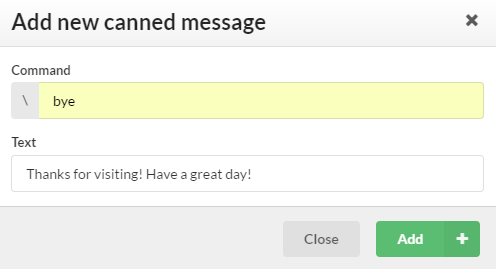 To reply to a conversation using a canned message simply type the slash key in the input box \ the available canned messages will then appear, from which you can select. To make selecting canned messages easier, each canned message has an associated command and multiple messages can belong to the same command so that they can be grouped. For example, if you type \greeting then only related greeting messages will be displayed. Note: normally the email is delivered to the user instantly, however there may be a small delay in feeding back the status of delivery to the dashboard. Email notifications for team members are only triggered to them if they are offline. The logic behind this is that if you are online, then the in-app notifications should be doing their job. You can be online on a browser, a desktop app or mobile. 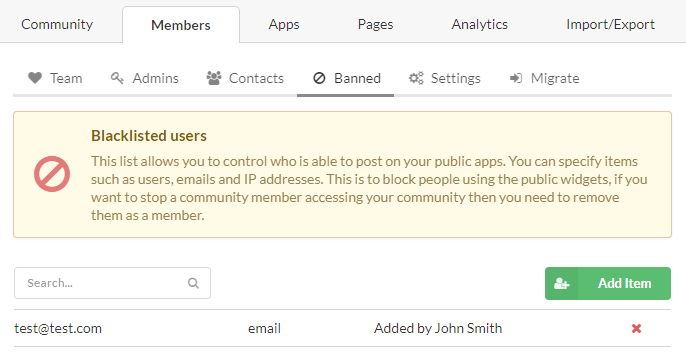 You can change the email notification settings in your profile area http://[community].pubble.io/profile > Apps / Groups. The settings for email notifications are individual to each person. It's important to note that the settings apply to email notifications only. The in-app notifications are always on. 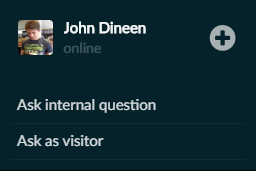 For new questions: If you are offline, you receive an email notification of a new question. 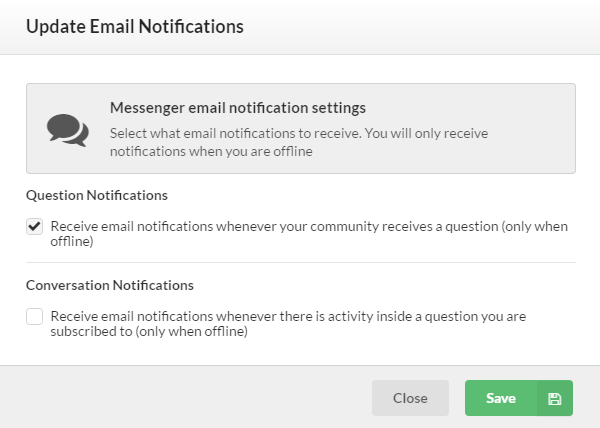 For activity within a question: If you are offline, you donâ€™t receive an email notification for activity within a question, if you are assigned to that question. (By replying to a question you are automatically assigned to that question. If you manually assign someone to a question or if there is a rule set up to automatically assign someone to a question, then they become part of the workflow for that question).